Home » Editorial » Flogging an (un)dead horse? At GenCon in 2016, with much pomp and ceremony, Fantasy Flight Games announced a new fantasy mass battle miniatures game – Runewars Miniatures Game, which was set in the lands of Terrinoth – the same universe as Descent and the Second Edition of Battlelore. The original box game saw it’s release just before Christmas 2016, and then new units were released once a quarter, with the third faction – the Latari Elves, being released in the middle of the year and the fourth – the chaotic Uthuk – coming out just before Christmas 2017. I was on board with Runewars from the start – attracted by the new take on command, control and initiative as well as the use of movement templates. The game was very different from what had been seen before, but I thought that was a good thing. 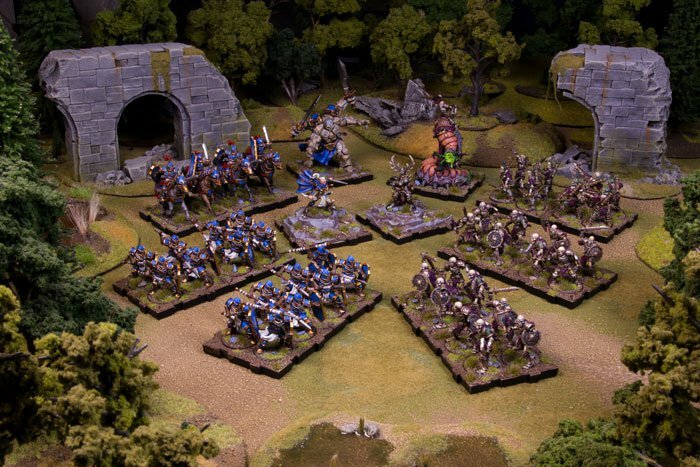 However, it’s fair to say that the game has struggled to gain any sort of traction in the UK – especially with competition from a resurgent Games Workshop in the shape of games like Shadespire and Necromunda – and as a result interest in the product appeared to tail off very quickly – something that could be tracked by the decreasing prices on the box sets at retailers throughout the country as they fought to sell their stock of these miniatures. Couple this with virtually no news of any new releases for the game in the first quarter of 2018, and it was becoming obvious that Runewars was potentially dead in the water. Anyone who walked the trade halls of the UK Games Expo at the start of June would have spotted Runewars everywhere at bargain bin prices – some of the larger retailers had gone as far as to cease stocking the game completely – Runewars simply was not selling. What is more, at the UKGE, Runewars was conspicuous by its absence at the large demo area that FFG had in hall 1. A game that is struggling to sell six months after release (at least in the UK) and the appearance of no support from the design company. I am sure I was not the only one who was putting two and two together – indeed, I resigned myself to the fact that like Ex-Illis before it, a fantasy game that I had backed heavily was a commercial failure. …we have seen the release of three new troop boxes for the Uthak faction, and announcements of new units and heroes for all four factions, all to be released in the third quarter of 2018. It would seem that FFG have suddenly remembered that they have a miniatures game that is not part of the Star Wars franchise. I find this sudden flurry of activity on the part of FFG to be a little strange. I know that due to large catalogue they have to schedule product releases several months, if not years, in advance, so it might just be the case that it has finally reached Runewars ‘turn’ for releases in the schedule. The trouble is, in the mean time, it appears that gamers have already moved on to the next ‘new and shiny’ product. To be fair, I believe that when FFG first announced Runewars to the UK market, they were told that their release schedule was not sufficient to hold the interest of gamers – it was suggested that new content should be released every month, rather than every quarter. It seems that this warning fell on deaf ears – either that, or nothing could be done to alter the existing schedule. So we find ourselves in strange position of potentially having new releases for a game that no one, or at least very few, stock anymore. Will these new releases be enough to rekindle interest in Runewars? The miniatures certainly look nice – in that somewhat stylised Runewars way – and the previews of the new units would seem to indicate that interesting elements are being introduced. But is this simply a case of too little, too late? If Runewars truly is something of a dead duck, what do you think caused it’s downfall? The rules? The miniatures? Or perhaps it was the unsightly activation dials? It will also be worth keeping an eye on if FFG have learnt from Runewars with the release schedule for Star Wars Legion. They are perhaps helped by the popularity of the IP, along with the fact that there are only two factions in the game – they certainly seem to be releasing units quicker for this game than they did foe Runewars. In the mean time, I find myself looking at two armies of miniatures which may only rarely see the table, if at all. At least I have an undead army ready for when Too Fat Lardies finally release the SotK fantasy rules. 9 Comments on Flogging an (un)dead horse? The literal words going through my head as I read your article and perused the photos were “too little too late”. And then I read that you had written the exact same thing! I picked up two half price copies here in Australia several months ago. Undead and Basileans for KoW I think. Even without Workshop picking up their game in the last couple of years the release schedule is still way too slow for miniatures gamers especially if they want to be building a community to keep the game alive and active. With the Star Wars having so few factions they probably also learnt some wrong lessons for the wider miniatures community. For me, the movement trays makes the game look like a pike of toys. The minis are ok.
As a UK gamer who likes fantasy games I liked the aesthetics of some of the models, thought the gameplay was OK (I found the plethora of tokens off-putting, but realised a lot of them actually are optional in reality) but never went near this . When it comes to buying brand new games, I’m willing to take a punt on the off chance on something that doesn’t take a lot of time or money, but there’s no way I’m going to commit to the huge slog of painting up an army (or two – remember I’d be having to find an opponent!) for a mass-battle format game like this unless its absolutely nailed on. And it has to be said, the price in the UK of US games is a little pricey compared to what Mantic or even GW offers these days, so to me it never looked like a goer, particularly given its bespoke fluff and aesthetic I couldn’t easily interchange models I already own, or add in units for it (like I can with Kings of War and Age of Sigmar for instance, althout AoS is increasingly moving away from mainstream fantasy tropes I admit). All bets are off in the US though. I completely fail to understand that market, which is so very different to the UK. Who knows what the yanks are thinking?! For me it was doomed from the start. Myself, and at least a few others were never going to look into it seriously. The combination of a mass of tokens and other utilities needed to play and a setting full of words that just sucked to try and pronounce had me completely disinterested. A few of the models looked … okay. But the rest were just too generic fantasy, and did little to inspire my imagination. Plus, it came out just as I was getting burnt out on X-Wing, so I was ready for something other than Fantasy Flight’s token and card heavy systems. Conquest: the last Argument of Kings will be the next mass combat fantasy game I take a closer look at due to the fact that the world looks much better developed.